Protesting barring of INTUC from tripartite consultations, 10 unions decry Govt’s attempt to ‘break unity’. 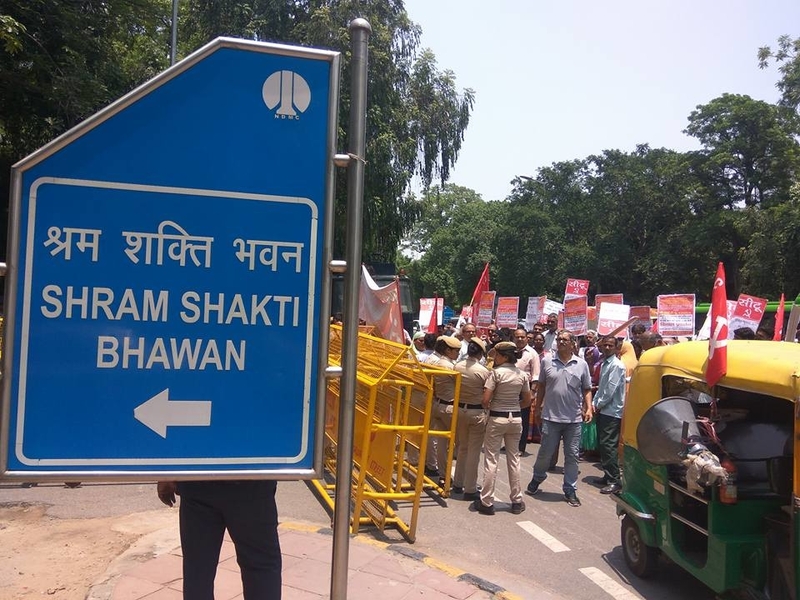 NEW DELHI: Tripartite negotiations initiated by the Labour Ministry over the new social security court are in jeopardy as 10 Central trade unions boycotted the latest round of talks on Thursday. The boycott comes after yet another attempt by the Ministry to debar the Congress-affiliated Indian National Trade Union Congress (INTUC). This was the third attempt by the Ministry to hold tripartite talks. All other unions were sent circulars to attend the consultations, but the INTUC was not invited. The boycott was backed by 10 unions, including the All India Trade Union Congress, Centre of Indian Trade Unions, Hind Mazdoor Sabha, INTUC and AIUTUC, among others, alleging that this is an attempt by the government to target the unity of the Union Movement. Thursday’s boycott is not the first of its kind. The boycott by the central trade unions has been ongoing since 2017 when the first round of negotiations was initiated by the government. Earlier, the unions had also written to Labour Minister Santosh Gangwar, expressing their united opinion that all unions must be made a part of the consultation process, as the labour reforms being proposed by the government had large implications. The letter of the boycott was signed by all the major protesting unions. However, time and again the Bharatiya Mazdoor Sangh (BMS), an RSS affiliate, refused to back the demands by the other unions. In July, the unions had alleged that the government was trying to stage-manage the issues of social security and was not taking the recommendations of the unions seriously. In a letter, the central TUs also alleged that the Labour Ministry had disregarded suggestions given by them in the past and decided go ahead with the proposed Bill in Parliament despite their opposition. “This has never happened with any government previously. This government is creating a facade of consulting us, when it is clearly anti-people, the only resort for us in these situations is to take to streets” , he added. The third round of consultations was also marred by the lack of any logistical support by the government for representatives coming from far-off states. For meetings scheduled previously, many representatives were informed of the negotiations barely 48 hours prior to the event. Given the “political apathy and lack of administrative support”, the crucial consultations now stand stalled. As a result of the lack of consensus on the key concerns, a major confrontation is set to take place between the government and the unions ahead of the election season. NewsClick had previously also reported on the opposition of the Trade Unions Amendment Act of 2018, which aims to give a wider recognition to unions at the central and the state level. The protesting unions have been pointing out that the central and the state governments have not adequately given weightage to trade unions in the absence of statutory backing. With this Act, the recognition hopes to fill the gap, but is being opposed on multiple other grounds. K. Hemalata, the president of CITU, had told Newsclick that “The Bill, in its current form, does not represent workers interests.” The Bill also does not tackle the issue of representation of unions at the enterprise level. Doubts have also been raised that the Bill may create an atmosphere wherein the unions may be weakened as they will shift their priority to being legitimised instead of prioritising workers interests.